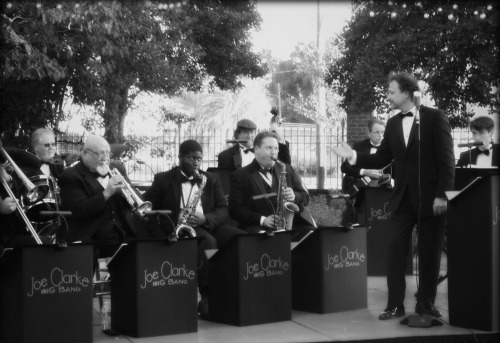 This band utilizes all of the musical elements of it’s 17 piece counterpart. The same rhythm section is used; Upright Bass, Drums, Piano, and Guitar. Then we add an Alto Saxophone, Tenor Saxophone, Trumpet, Trombone. The harmonies and fullness of a larger group are present but this band comes in a handy travel size for your convenience. The instrumentalist have been selected from the best that the Charleston area has to offer. Many of them hail from other parts of the country and bring there own unique qualities to the group. Joe Clarke sings and plays the piano. He has also arranged many of the tunes in the book. Jenna Brinson compliments the stage with her sophisticated vocal style and stunning beauty. Jenna and Joe have also worked together on 5 musical productions at the Village Playhouse since 2001. The 9 piece Big Band songlist was created to reflect the best of the big band era.